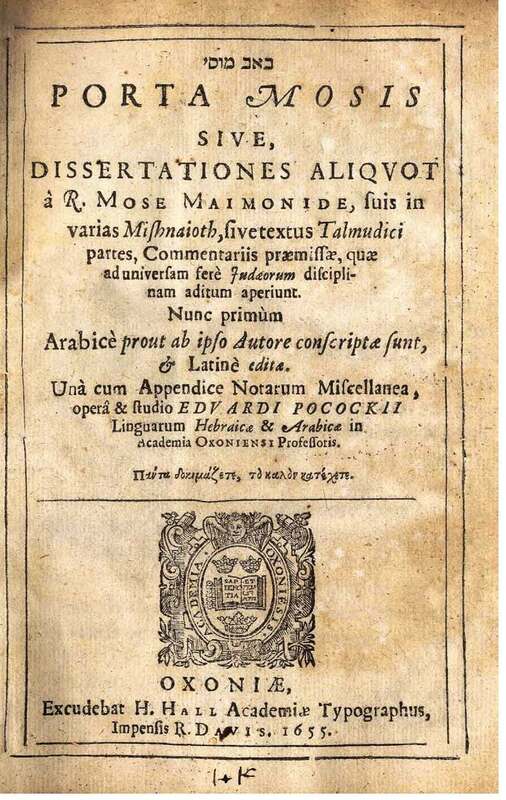 At the dawning of the 17th century, in England and the West generally, Arabic studies—and even more so the study of Jewish texts in Arabic—was still very much in its infancy. This was due in no small part to the relative paucity of Arabic manuscripts in Western libraries and the consequent limitations on access to Arabic texts faced by late-Renaissance scholars (whose interest in Arabic texts at this point was also largely dominated by ecclesiastical concerns and Bible translation in particular). 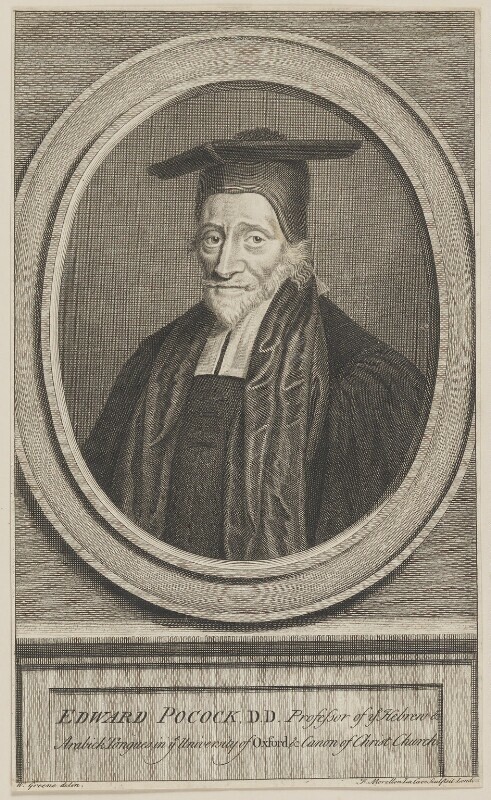 Onto this scene stepped Edward Pococke (1604–91), an alumnus of Corpus Christi College at Oxford and ordained priest in the Church of England whose interest and training in Semitic languages ultimately led to his appointment as Oxford’s first (Laudian) Professor of Arabic. He also spent several years in Constantinople and Aleppo, during which time he collected hundreds of Oriental manuscripts (purchased by Oxford in 1693). Through his teaching, writing, and manuscript collecting Pococke thus played a seminal role in the European flowering of Arabic studies, facilitating Western scholarship’s exposure to and appreciation of the rich literary heritage of Arabic—and not only of Christian and Muslim Arabic literature, but also, even at that early stage, of Jewish Arabic literature, from which he cited profusely (both text and translation) in his published works. 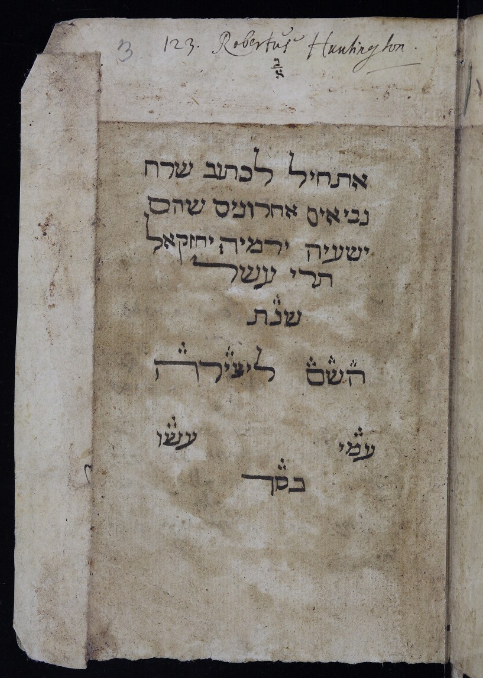 Pococke’s pioneering activity in this field was first impressed upon me during the course of my work on an edition (published by Magnes, 2010) of the Judaeo-Arabic commentaries on Ruth and Esther by Tanḥum ha-Yerushalmi (d. 1291, Fustat), the last known exegete of the “rationalistic” school to write in Judaeo-Arabic. Pococke was the first to acquire manuscripts of Tanḥum’s work for western scholarship (including the unique manuscript on which my edition was based). He also was first to quote or refer to Tanḥum in publication (as he does more than 200 times in his Porta Mosis, which includes extracts from the Arabic commentary of Maimonides on the Mishnah, and commentaries on Hosea, Joel, Micah, and Malachi, all in the service of elucidating the biblical text). When preparing the bibliography of Karaite Arabic Bible translation for Biblia Arabica, I was reminded anew of Pococke’s industry in filling this seminal role, this time in utilizing the anonymous recension of Yefet b. Eli’s Judaeo-Arabic translation of the Latter Prophets contained in Ms. Huntington 206 of the Bodleian Library. There is no name of the author expressed (that I find) in the copy. Whether it be the work of R. Saadiah Haggaon … I have reason to doubt, seeing the prophecy of Isaiah, which is in the same volume, differs from what I find in another copy of that prophecy, which bears his name. And it is certain that others of the Jews, besides him, did translate the Scriptures (or part of them) into that language, and therefore if it be any where by me cited as his, it is not positively affirm’d, and I almost think it is not his. Whose ever it be, it seems to be of some antiquity, for it is not of late years that the Jews have used to write in Arabick, as formerly they did …. 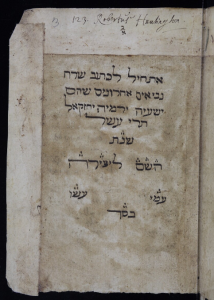 This Translation, and this Note, seems an argument that this Translation is R. Saadiah’s, tho’ in the copy that we use, we find not his name expressed; because R. David Kimchi takes notice that by R. Saadiah the word כחכי Cechacce was so rendered …. Of course, had Pococke been familiar with Yefet’s work on Hosea, he would have known that both the translation and the “note” were his (the latter being an abridged extract from Yefet’s full comment), regardless of whether the famous Provençal scholar David Qimḥi (ca. 1160–ca. 1235) is right that the same interpretation was shared by Saadia. In the passage of his commentary on Hosea to which Pococke refers, Qimḥi himself likely had Yefet in mind—though as elsewhere, and like other medieval Rabbanite exegetes, he refrains from explicitly identifying his Karaite source(s)—since he prefaces the view with attribution to “interpreters” (ויש מפרשים), and only after giving the view notes that Saadia interpreted the passage likewise (וכן פירשו רב סעדיה גאון ז״ל). That Saadia did indeed hold this view, moreover, may be open to question, considering that the only testimony to such (at least according to Ratzaby, מפירושי רב סעדיה למקרא) is Qimḥi’s comment—assuming also that the concluding attribution to Saadia is genuinely his. 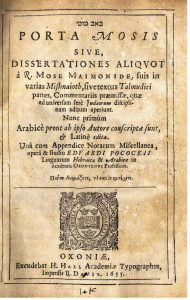 At any rate, as Pococke’s use of this manuscript bears out, the printed history of Judaeo-Arabic Bible translation—both Karaite and Rabbanite—as well as the contribution of such to the history of biblical interpretation, extends well beyond discrete editions, chrestomathic excerpts, and devoted studies of Judaeo-Arabic translation to the much smaller citations tucked away and hidden from view amidst the pages of works dealing with more comprehensive topics than translation alone—including early modern works, like Pococke’s biblical commentaries, printed more than three centuries ago. Michael G. Wechsler is a full professor in the Bible Program at the Moody Bible Institute in Chicago. His current research centers on the publication of Judaeo-Arabic exegetical literature as well as the study of the intercommunal and interconfessional interplay of ideas more generally reflected in Near-Eastern exegetical literature (Jewish and Christian).